The Oregon and Washington Cascades are just over an hour away from downtown Portland, Oregon. The snow filled Cascade Mountain Range flows abundantly during the spring and summer months and provides an excellent opportunity for whitewater rafting trips. 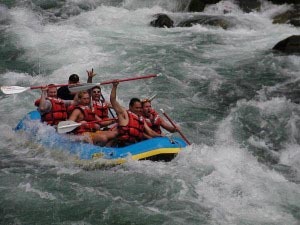 Sea to Summit’s creator and owner has been a whitewater rafting guide for over 2 decades in the Pacific Northwest and has chosen two of he best local whitewater rafting rivers for our clients! Travel along the Historic Columbia River Highway, tour majestic Multnomah Falls and continue on to the scenic town of Hood River, Oregon. Here we cross the Columbia River and arrive at Washington’s class IV White Salmon River. The excitement continues as we enjoy a day of exhilarating white water rafting, including Americas famous 16ft Husum Falls, second tallest commercially run waterfall in North America! Nestled in the Cascade Range between Mt.Hood and Mt. 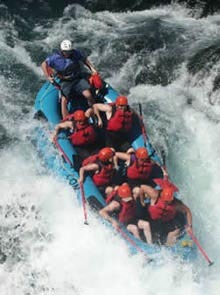 Jefferson lies the Clackamas River, one of Oregons finest whitewater rafting rivers. During the spring and early summer months, the Upper Clackamas Rafting Trip runs the full 13 miles while experiencing dozens of exciting rapids, breathtaking views of old growth forest, and a wide variety of wildlife. These Whitewater Rafting trips are filled with a full day of excitement and are perfect for families, corporate team-building events and groups visiting Portland, Oregon who truly want to experience the Great Pacific NW!